﻿As of late I have really been getting into winged, cat eye liner - possibly due to my love affair with both Chrisspy and Nikkei Tutorials. To achieve said eye liner look I have purchased two felt tip type liners that have quickly muscled their way into my everyday make up routine. First up is the Soap & Glory Super Cat Fat Liner which was purchased accidentally (I meant to get the original.. which I later got as a Christmas present anyway) and at first I was rather bitter about - a couple of quid extra and a fat nib was not a pleasant surprise I'm sure you will all agree. But soon I let my grudge go and I began to come to terms with the fact that now I've got it, I may as well use it. I'm not much of a fan of the extra large nib as it just makes eyeliner a whole lot more difficult. I just take my MAC 263 Angled Liner Brush to dab it onto the nib and go from there - it makes eyeliner so much easier and the tiny tiny MAC 263 brush is amazing at getting a thin line right in the inner corner. Of course, you could use the 263 brush the whole way across your eye but I like to use the original Super Cat Liner for the rest of my eye. SO unnecessary, I know, but seeing as I received the original as a crimbo present I may as well put it to good use! So, using the original Super Cat Liner which has a much thinner nib, I do the rest of the line and the wing. The shape of the nib makes the wing so much easier and now the only problem I face is getting them even, which never goes well. The formulation of both eyeliner pens are really nice - jet black and last for most of the day. 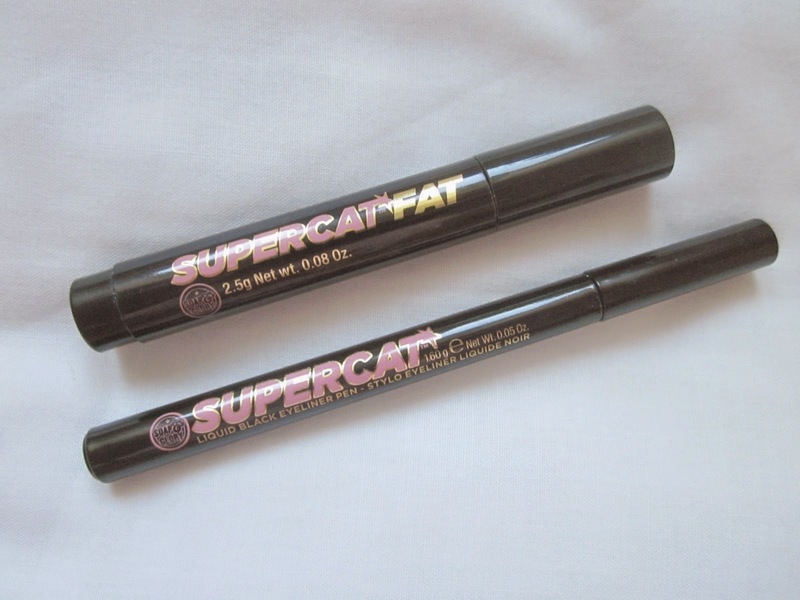 Of course, having the two is totally unnecessary and down right ridiculous so if I had to recommend one it would be the original Soap & Glory Super Cat Liner. It has a much thinner nib making eyeliner a little more manageable and if you want, you could still use an angled brush with it. What's your favourite liquid/felt tip type liner? 22 comments on "THE EYELINERS"
I prefer a more liquid liner than using a pen, but these look really nice! I've been wanting to get the original one for ages now, heard so many good things! I will double check though, to make sure I don't accidentally pick up the fat one ahaha!